Become part of the movement to stop bullying by taking a stand and spreading its awareness. Wearing an Anti-Bullying Awareness T-Shirt like this is one of the first steps towards ridding the world of bullying. Show your support with this t-shirt at your next Anti Bullying Awareness Event and motivate others to get involved. 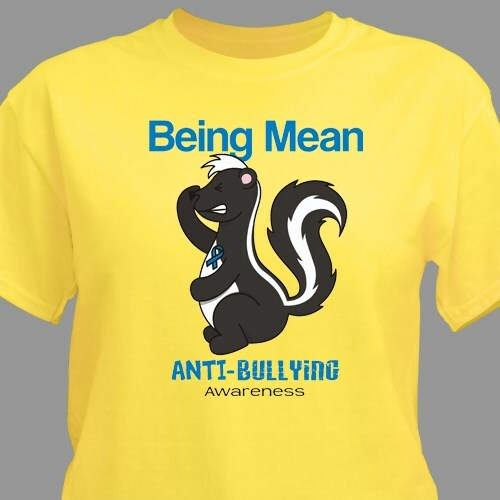 Our Being Mean Stinks Anti Bullying Awareness T-Shirt is available on our premium 100% cotton shirts, machine washable in youth sizes XS-L & adult S-3XL. Additional Info Signify the importance of National Bullying Prevention Awareness Month with Awareness Apparel from MyWalkGear.com. You too can become a part of the movement to stop bullying with awareness apparel & walk gear. Be sure to also take a look at this inspiring design as our Anti Bullying Awareness Sweatshirt & our Anti Bullying Awareness Key Chain as well.